Over the years I've started a small instrument collection. The crazy part is I attempt to play most of these from time to time. I have very few (well none really) museum pieces. All are tools and all are fun to play! 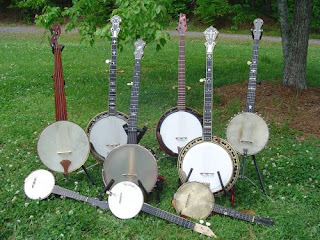 All My Banjos - More than I can play in a day. Ramsey Woody - An amazing Banjo - Very Loud - A blast to play! Price Knight - Beautiful Wood, Beautiful Tone! Ramsey Minstrel - Big mellow sound - I Love it! George C. Dobson Victor - A-Scale and a treat to play. Unknown Mini/Piccolo Banjo - Wow, it's tiny! I hope you enjoyed looking at all the banjos!